I went to Uluru in 1982 when it was still largely called Ayers Rock, and before it was handed back to the Aboriginal owners. I climbed the rock – not really sure why but our entire group did. 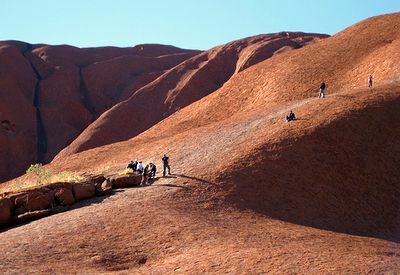 After the climb we trekked around the perimeter of Uluru – and that was an amazing experience. It has so many different nooks, groves of trees, different light and ambiences. Walking around it, I could experience the rock and the land, and be in communication with it. I thoroughly recommend that walk for a glimpse into our Australian heritage. Thank you for RESPECTING our culture.